I've seen this dress: http://i170.photobucket.com/albums/u243/fluffybunnee/Simpledresscropped.jpg and I don't know who the designer is. Any idea? Thanks! no idea but it's gorgeous. And I ended up buying the dress as it was going for a song on Ebay from a specialist seller in Spain. It arrives in a few days! This designer doesn't sell over in the UK and I figured that it wasn't a vast sum of money so I might as well chance it cause it may very well be the ONE! I'm not being weird or anything am I? Well according to the FedEx tracker, it will be here tomorrow! Wish me luck! Any news on your delivery? Hope all goes well. Sigh, it turns out that the FedEx website was a bit misleading. The package is actually still in Spain at the moment but as soon as the person sending my package logged their intention to send, the computer automatically generated an estimated delivery date even though they haven't gone to fetch the dress yet! I told off the people at FedEx and am keeping a beady eye on the tracking of it now! Ah the joy of dealing with courier companies! Unfortunately nothing ever goes as smoothly as you'd like. I'll keep my fingers crossed that it gets to you without any other hitches! FedEx tracker now showing that package has been picked up and will be here tomorrow! I'll let you know how it goes and if the company are as good as their word as they also stock a lot of Forever Yours and Pronovias dresses at much reduced prices! Well I have the dress and have only had a sneaky peak in the side of the box. It looks nice from what I can see of it! Going to try it on tonight! I tried on the dress and have to say that the material is fabulous. Really heavy and drapes well. I do really like the dress but am not sure that it is the One but it's close! As I don't have to make any decisions for a while, I'm going to keep on looking at others. I have linked two photos, with face smudged to hide me in case hubby goes on the prowl. The top doesn't fit so well as the chest area is too big for me and has to be altered. Also I am very, very short so the skirt would have to be altered as well. I do think the dress is rather stunning though! Please let me know what you think. The dress was advertised as new but by that I think they meant a sample as there was the tiniest bit of dust on the train. The dress was absolutely immaculate apart from that and I bought it on Sunday and it arrived today! 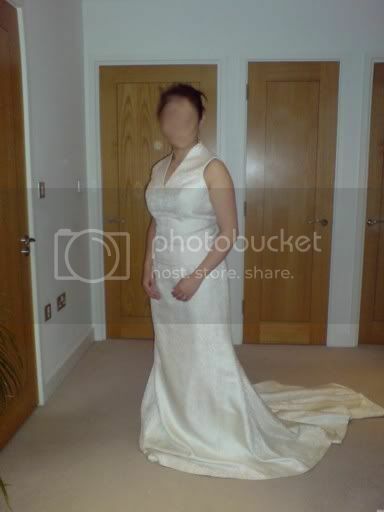 I wouldn't hesitate to recommend the seller: http://stores.ebay.co.uk/BrideCenter-Store Have a look in their Outlet as that is where I got my dress for such a good price! Sorry for the delay in replying my home computer has been playing up but I managed to fix it today - feeling v proud of myself! I really like your dress, it can surely be fitted by a good dressmaker if its not a perfect fit right now. You can't beat the feeling of good quality material, it makes the dress feel extra special. I'm only 5ft 3 myself and I'm finding that the sheath / column style of dress makes me look that bit taller. I actually saw a similar dress to yours in the new Perfect Wedding magazine http://www.sol.co.uk/s/scotbrides/PB0932.htm although it is a different colour to yours I thought it was very similar. 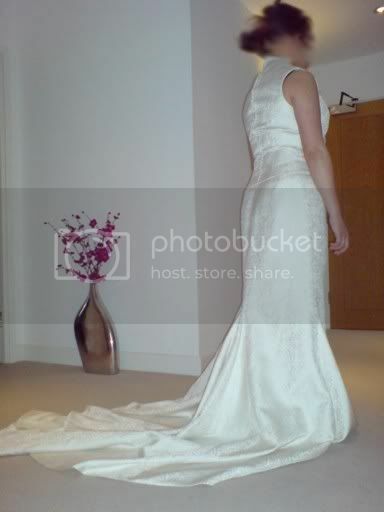 Even if this isn't the one I still think its a beautiful dress and a very flattering shape on you. Good luck with whatever decision you make. Glad you got your dress! I hate having to wait for things to be delivered...each day just seems to drag. The dress looks great on! The fabric looks good and like you said it hangs really well.